Kwanzaa-bot is a robot built to hand out the traditional Kwanzaa gift, a book called What the Hell Is Kwanza?. 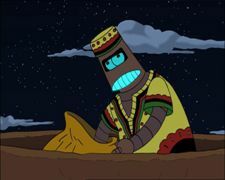 Kwanzaa-bot is good friends with both the Chanukah Zombie and Robot Santa, though he failed to recognise that Santa was replaced by Bender during Xmas of 3001. In 3007, Kwanzaa-bot, forming part of the Holiday Trinity, played a key role in freeing Earth from the control of the scammers, helping with both weapon construction and the battle itself. This page was last edited on 1 June 2014, at 07:15.